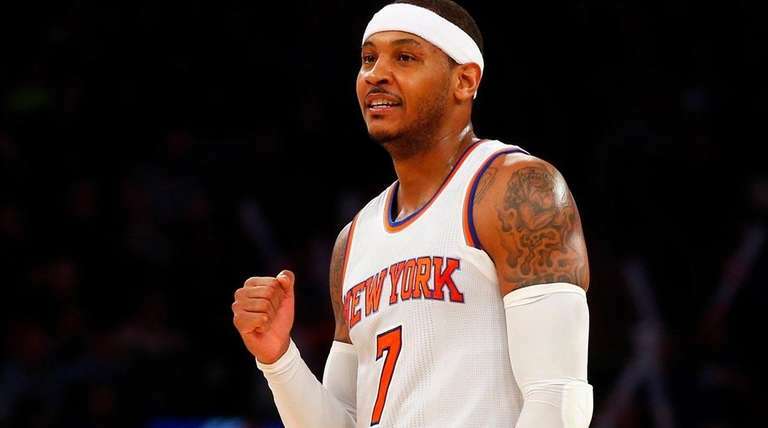 GREENBURGH, N.Y. — Carmelo Anthony’s extended Christmas break soon should be coming to an end. Anthony missed Wednesday night’s 91-84 loss at Cleveland while recovering from an ankle sprain suffered on Monday night against the Magic. He also will have a rare Christmas off; the Knicks are not part of the NBA’s nationally televised marquee lineup for the first time since 2008. But he spent Christmas Eve practicing with the Knicks, hoisting jumpers after nearly all of his teammates had left the court. Anthony said he was feeling better and seemed convinced that he will be able to play on Saturday night in Atlanta. With a stretch of three games in four nights starting on Saturday night, Anthony elected to rest the ankle rather than push it against the Cavaliers. It was the second game that he missed this season; illness kept him out of the Knicks’ 116-111 loss to the Rockets on Nov. 30. Derek Fisher said Anthony participated in “probably 90 percent of the things we did today” at Thursday’s practice but was held out of some contact drills. Even without Anthony, the Knicks managed to stay with the Cavaliers, who had their Big Three of LeBron James, Kevin Love and Kyrie Irving on the court. But without Anthony to shoulder the scoring load in the fourth quarter, the Knicks were held to 12 points. Despite the loss, Anthony was impressed with his team’s ability to compete with the defending Eastern Conference champions.